This 2.84 acre gated estate includes a 3,432 sq. ft., 4 bedroom, 3.5 bath home on 1.78 ares, and an adjoining one acre lot which qualifies for one additional residence. Located at the entrance to Kauai’s North Shore, Mali’e Wai is close to numerous amenities, and just minutes from some of the island’s finest beaches. $2,875,000 fee simple (MLS# 259825). I see a lot of homes in my career as a real estate agent on Kauai – many are grandly designed with no expense spared. And I can tell you this: there is “good design,” there is “great design,” and then there are architectural gems. This is one. 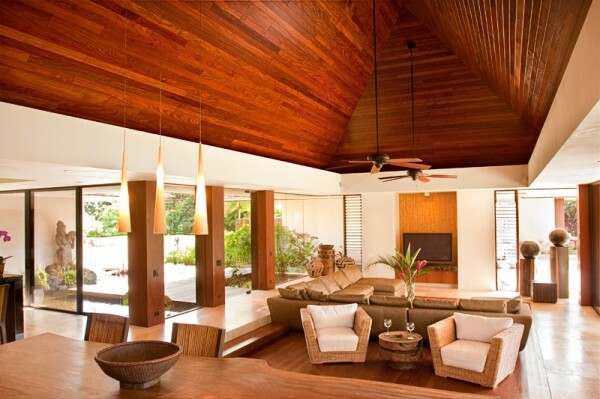 Fusing the steep pitched roofs favored by the ancient Hawaiians with the best of contemporary architecture, Gary Tobey designs some of the most beautiful homes on Kauai. 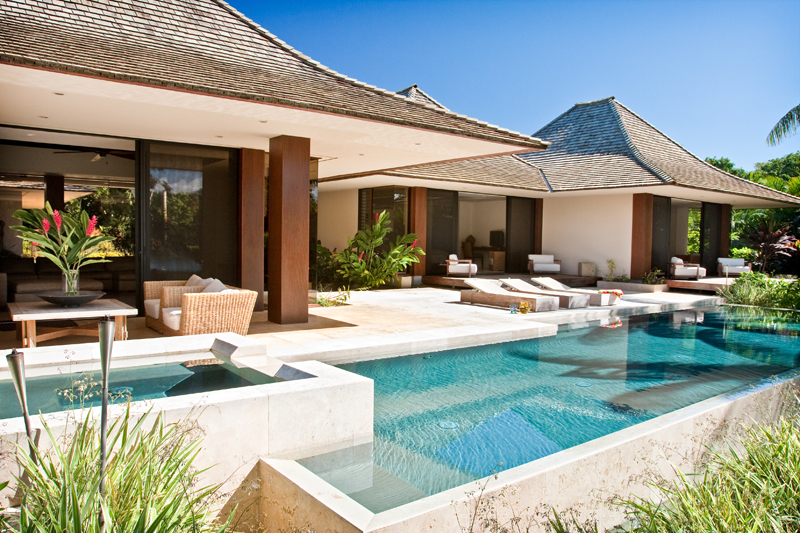 Indoor/outdoor living is a hallmark of the island lifestyle, and creating homes that are open to the outdoors – yet sheltered from the elements – is an intricate dance. It’s one that Tobey has mastered. Flooded with natural light, his homes are open to nature – yet completely private. Tinted glass, deep overhangs, and careful site orientation keeps the homes cool and comfortable year round. An artful blend of diverse materials – from deep, dark woods to stone, bamboo and steel – his homes feel more spacious than properties twice their size. Vaulted ceilings add volume, built-in furniture maximizes space, and the walls of glass invite the outdoors in. Can you tell I’m a fan? And I haven’t even mentioned the infinity edge pool, the thatched lakeside cabana, the pod bedrooms, outdoor shower gardens, and the abundance of lychee, lemon, and avocado trees. Sign up to receive Kauai Real Estate News and Updates. Ben Welborn REALTOR (B), LIC# RB-19358 and Tiffany Spencer REALTOR (S), LIC# RS-62202 are Kauai REALTORS® with Hawaii Life Real Estate Brokers. Everything © copyright Ben Welborn, Tiffany Spencer REALTORS® and Hawaii Life.